Balls of ground chickpeas tossed into vats of sizzling oil and served with pickles and salads inside a pitta bread is a standard fast food across much of West Asia. But the ubiquitous, family owned falafel street stalls and cafes in Israel faced a challenge earlier this year when McDonald’s introduced the “McFalafel”, the global burger chain’s own version of the staple, in the country. Now, in a rare admission of defeat, it is withdrawing the McFalafel, saying it was an experiment that did not work. 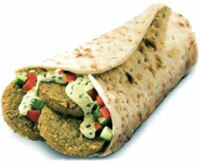 “It was disgusting,” a teenager said as she passed by a hoarding displaying the new McFalafel. Even visitors to Israel agree. The Taylor family from the UK, in Jerusalem for a party, said they would never patronise a “non-traditional” falafel outlet. “It is street food, not pre-packaged,” said Howard Taylor.